News Flash! Walt Disney Records has announced the release of Frozen: The Songs CD, plus three additional titles. On September 30th, all 10 of the most loved songs from the 2013 Oscar-winning film, Frozen, a vinyl edition and a Spanish language version Frozen Canciones de Una Aventura Congelada will be available for purchase. 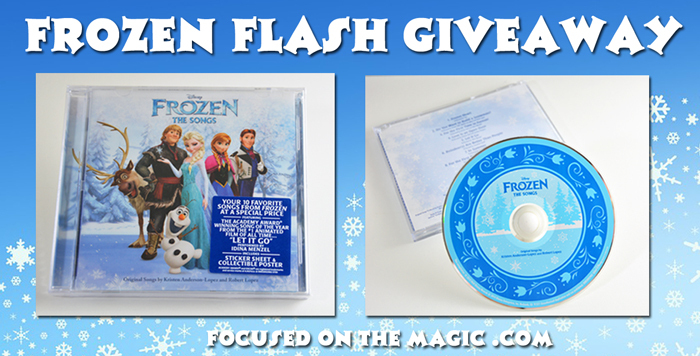 We're having a Frozen Flash Giveaway! Two lucky winners will win a Frozen: The Songs CD. Details below. We are huge Frozen fans as you may have guessed from our frequent Frozen related posts. When this CD arrived I popped it right in the car's player and we were immediately surrounded by the magic of the music that we have grown to love very much. 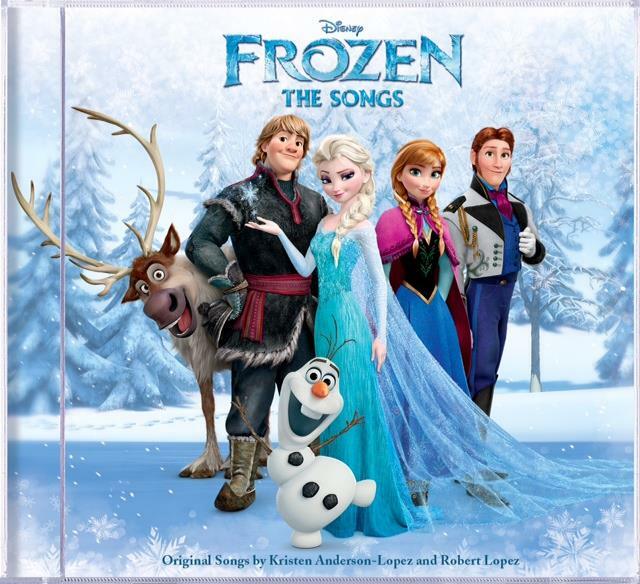 Frozen: The Songs CD has all the most memorable songs from the movie and more. My favorite song is "Let It Go" and my sons is "Do You Want To Build a Snowman". We have pretty much all the words memorized but when we were stuck for a lyric my son was able to refer to the song sheet enclosed in the jewel case. We sang our hearts out and laughed all the way home. On the flip side of the song list is a great wall poster. Oh, and there is a fun sticker sheet as well. The specially priced Songs CD also includes a fold-out poster with a song sheet on the opposite side and stickers. Frozen: The Songs, Frozen: The Songs Vinyl Soundtrack, Frozen Canciones de Una Aventura Congelada, and the Frozen Score digital album will be available on September 30, 2014. For more information on Walt Disney Records’ releases, Facebook or follow on Twitter. To purchase Disney music, visit the online store at www.disneymusicstore.com. Now it's time for The Frozen Flash Giveaway! 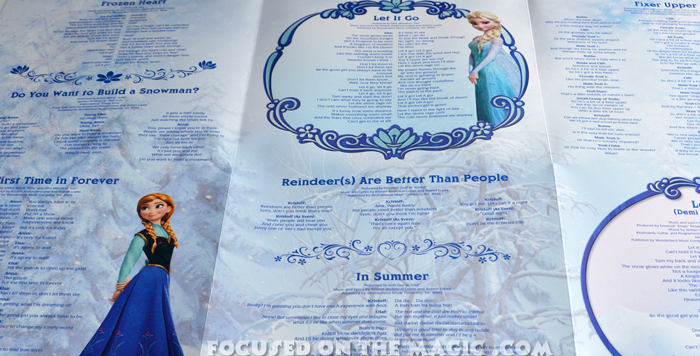 Two lucky Focused on the Magic readers will win a Copy of "Frozen: The Songs" CD. Prizes will be sent directly to the winners from Walt Disney Records. Please allow 6-8 weeks for shipping. The giveaway will run from now until 10/3/2014 at 12:00 AM EST. The winner will be chosen by random number generator via Rafflecopter after verification of entries and notified by email. The number of eligible entries received to determine the odds of winning. The giveaway is open to United States residents only. You must be over 18 years of age and you guarantee that you are eligible by entering. All opinions are the author’s own. Your experience may be very different. No purchase is necessary. One entry per person per household, email, IP. If it comes to our attention that the winner of our giveaway has won on an additional blog, Focused on the Magic reserves the right to choose another winner. The winners will be announced on the Focused on the Magic Giveaway page after the winner s have accepted their prizes. Entering is easy through the Rafflecopter form below. This has ended. 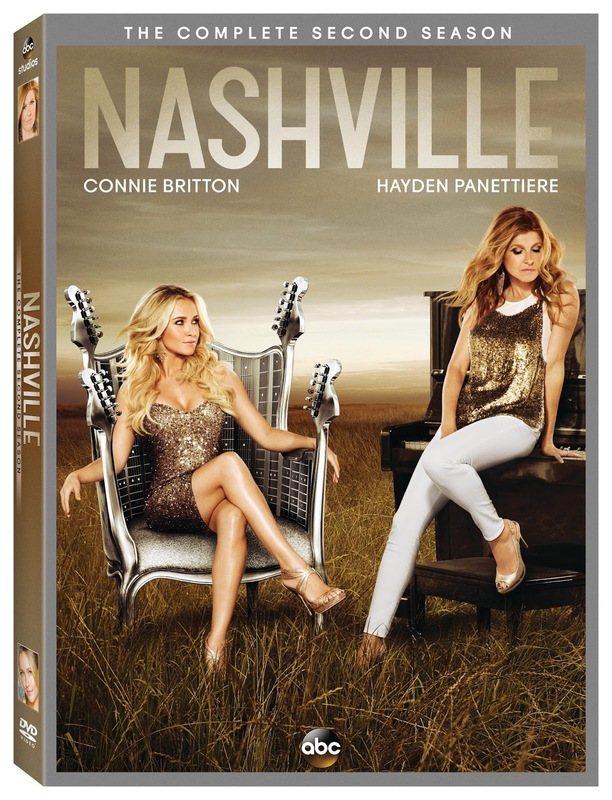 This giveaway has ended "Nashville" The Complete Second Season" DVD Set Giveaway?